You all know it's farmers market season, and beyond knowing it, I hope you're getting out to see what's growing, smell the flowers, stock up on chicken eggs, choose some seafood for supper, take in the glow of local honey gleaming in glass jars, and get in on the baked goods, smoothies, wood-fired pizzas, and general delight created by people selling directly to people with dogs, strollers, weather, and live music all in the mix. But it's not only farmers market season; you can also find weekly artisan/thrift/vintage/flea markets, and monthly night markets in Tacoma! Take a look at our list, and don't let yourself believe you're too busy for this. Life is made more lively by enjoyment of community. Go bump into someone. Treasures from the Proctor Farmers' Market and La Paloma Proctor. 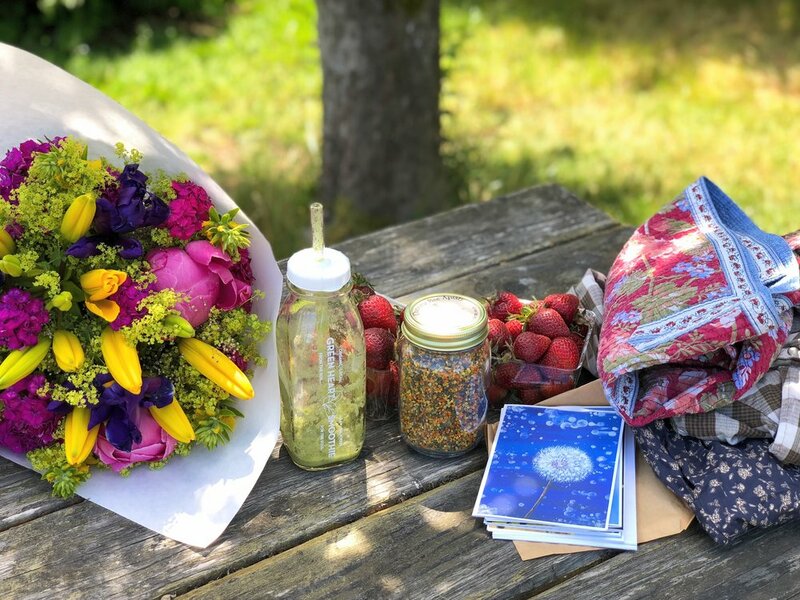 Greenheart Smoothie, Spooner Farms strawberries, cards by Kelly Falk, Dancing Bee Apiary pollen, and vintage/thrift apparel finds. Fresh, locally grown flowers from the Eastside Farmers Market. These went straight down the street from the market to the home of our clients. Best part of the job! 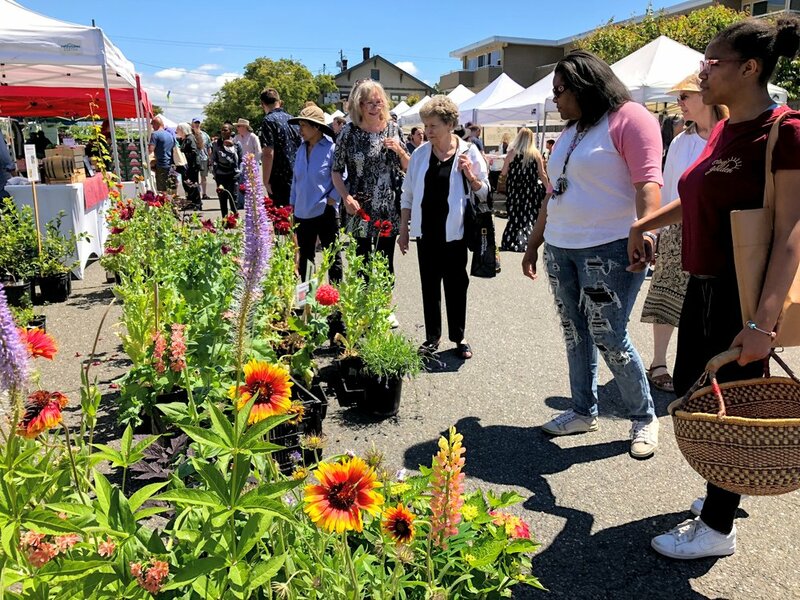 The Tacoma Farmers Market operates in 4 locations, with the Proctor Farmers' Market doing its own thing every Saturday, so that makes 5 days of the week for going to market with your reusable bags and baskets to fill with food and flowers. With 2 weekly and 1 monthly La Paloma Artisan & Vintage Marketplace locations (formerly Tacoma Flea Market), the monthly Tacoma Night Markets, and other pop-up markets you barely go a day without a venue for directly supporting local artists, makers, and resellers in our city. The La Paloma markets focus on vintage and handmade goods, and also have live music, food, and treats from vendors like Local Bun (cookies! ), Avocado & Co (caramel apples and tamales! ), and Jan Parker Cookery (chicken bowls!). Our list is in day-of-the-week order and includes 2 bonus out-of-town markets at the end. Enjoy! Unlike the other La Paloma markets, this one has more opportunities for bartering and haggling! Eastside Farmers Market gorgeous produce display. My Eastside Market choices: radishes, honey crisps, tomatoes, and apricots. Goodness brought home from the Broadway Farmers Market from Adam's Mushrooms, L'Arche Farm & Gardens, and a local flower farm. 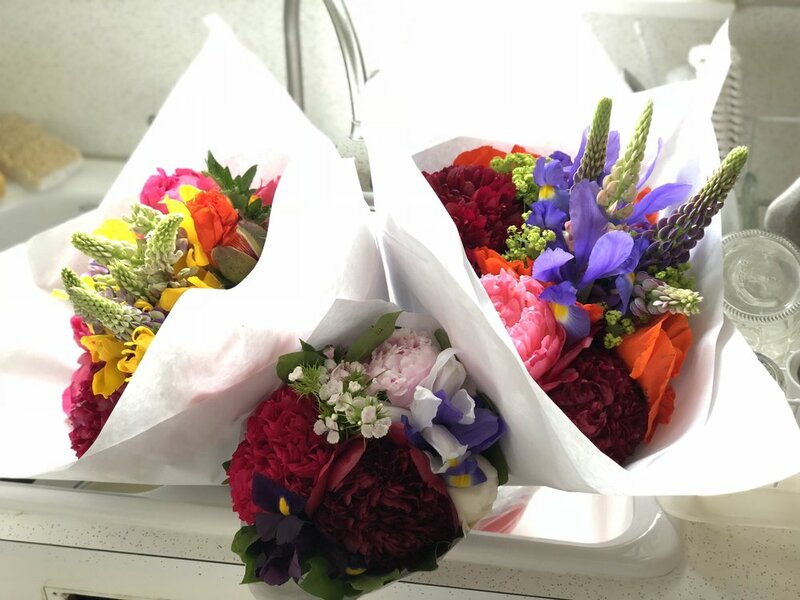 Broadway Market Bouquets - Sometimes you need 3! These were just $10 for the larger and $5 for the smaller. Amazing! Proctor Farmers' Market on a sunny June day. La Paloma Proctor vintage and reclaimed clothing for children, women, and men. La Paloma Proctor's Woodland Teatime fanciful table of felted pieces and jewelry. If you just LOVE markets so much, make sure you're following Downtown Tacoma Market so you won't miss their pop-up markets at Courthouse Square (home of Lift Bridge Coffee and en Rama). You'll also want to follow Happy Fox Studio Jewelry, host and organizer of wonderful local makers-markets that pop-up around our city. Like to take a little day trip and go a bit further afield for your markets? We can recommend 2 personally. Oxalis Kitchen's first day at the market with chef Darice Grass getting her menu board all set. 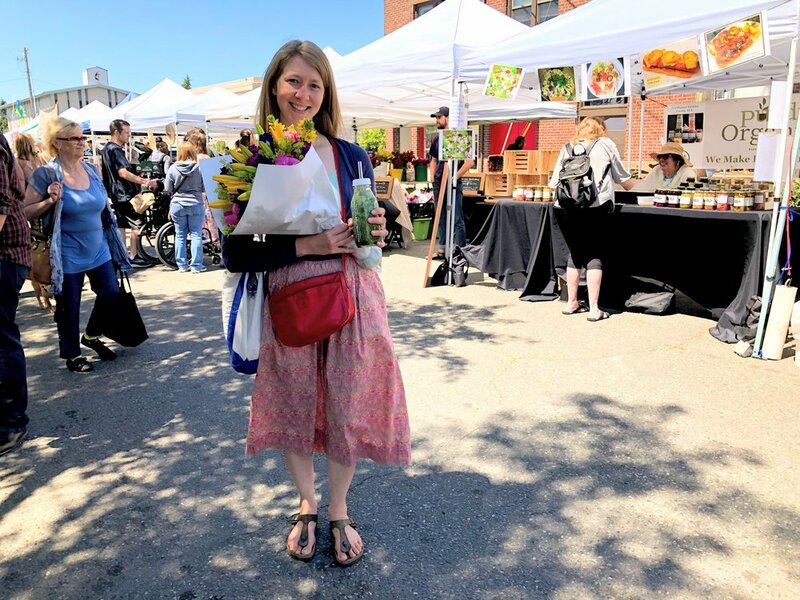 This is the market where our sister-in-law is the chef behind Oxalis Kitchen. This lady has food magic in all her fingertips. savory rye galettes: fresh, from- scratch, full-meal-in-the-palm-of-your-hand tarts with rye flour crust, green garlic mascarpone, mushrooms, onions, peppers, prosciutto, etc. Of course, she's not the only booth at the market - you'll find fresh produce, honey, crafts, a knife sharpener, pickles, flowers, bread and baked goods - but you have to visit her and eat. P.S. - Oxalis Kitchen sells out! At this market our cousin The Vintage Baker also sells out of her delectable sweet treats of every shape, size, color, and flavor. Cookies, scones, layer cakes, mini pies, turnovers, sweet rolls. If it's sweet, makes your mouth water, and has you considering dessert for breakfast, lunch, and dinner, she bakes it. You might find savory croissants as well if that's more your thing. This is another market with all the works: produce, music, food vendors, and all that jazz. A hands-arms-and-bag-ful kind of day at the Proctor Farmers' Market. Thanks to a sweet stranger for snapping this photo! The moral of the story is, don't lament the selection and experience of the super market, and don't feel like you'd better just head to some big-box store next time you want to give a gift. Fresh, local, outdoor, seasonal markets are the perfect salve for your woes. If you don't buy anything, you'll still see something, you'll feel something, you'll be awakened just a bit. See you out there! Newer PostIt's July in Tacoma - 15 Community Events You'll Love!